Claire Guthrie Gastañaga (formerly known professionally as R. Claire Guthrie) is the Executive Director of the American Civil Liberties Union of Virginia. Before becoming the ED at the ACLU of Virginia on June 1, 2012, Ms. Gastañaga was the principal of CG2 Consulting - a consulting firm that specialized in providing strategic governance, management and public policy advice to colleges and other not-for-profit organizations and trade associations, and of a law firm, CG2 Legal Strategies, PLC, that provided strategic legal counsel to not-for-profit organizations and women and minority owned businesses. Ms. Gastañaga served as Chief Deputy Attorney General of Virginia in 1993-94 and as Deputy Attorney General of the Human and Natural Resources Division from 1986-93. She is the first woman ever to serve as Virginia's Chief Deputy. As Chief Deputy, Ms. Gastañaga supervised the legal work, shared responsibility for the budget and day-to-day operations and guided the legislative activities of the Office of the Attorney General -- a public law firm with an annual budget then exceeding $15 million and over 250 employees. As a Deputy, she served as the Office's “hiring partner” supervising attorney recruitment and hiring and managed the legal representation of state agencies in the Human Resources, Natural Resources and Higher Education Secretariats. She also argued cases in the United States Supreme Court and the Supreme Court of Virginia, led a nation-wide recall of Ford E350 ambulances, and helped shut down a rayon manufacturing plant that was polluting ground, air and water in Northwest Virginia. In Wilder v. VHA, she shared oral argument time in the U.S. Supreme Court with now Chief Justice John Roberts and was opposed by former Solicitor General Walter Dellinger in his first Supreme Court appearance. Ms. Gastañaga started her career as a federal civil rights lawyer and then served as assistant university counsel and assistant secretary of the corporation at Princeton University, where she staffed several committees of the Board of Trustees and lectured in the politics department. Later, as assistant general counsel and associate director of the Office of Federal Regulatory Affairs at the American Council on Education, she managed a variety of federal regulatory issues affecting higher education including affirmative action, gender equity in athletics, unrelated business income tax, human subject research, small producer hazardous waste and reasonable accommodation of disabled students, faculty and staff. While in private practice at Hogan & Hartson (now Hogan Lovells), Ms. Gastañaga represented and advised public and private colleges and universities on accreditation matters, faculty tenure issues, academic freedom, governance issues, health care provider questions, environmental issues, export/import problems, building design and construction problems, government contracts and audit issues, Title IX compliance and student personnel matters, among others. Ms. Gastañaga was a trustee of Chatham College from 1981-87, and she served as the College's interim president during the 1982-83 school year -- a year in which the College overcame a serious budget deficit, reduced the size of its faculty and staff and implemented a new core curriculum. Ms. Gastañaga is a former director of the National Association of College and University Attorneys (NACUA) and was honored as one of the first two "Fellows" of the Association in recognition of her contributions to higher education law. In 2002, the Governor of Virginia appointed Ms. Gastañaga to a four-year term as one of Virginia's Commissioners on the Education Commission of the States. In 2007, she was appointed by the Governor to the Virginia Small Business Advisory Board. 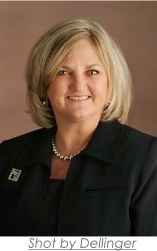 In 2010, she was named as one of 50 Virginia Women of Influence by Virginia Lawyer's Weekly. Ms. Gastañaga's skill in bringing diverse people together to address issues of common concern was highlighted in "The Facilitator," a cover story in the Metro Business magazine of the Richmond Times Dispatch.